A regular poster in the rec-scuba news group sent me an email about the 1996 Indian movie, Aatank. The movie is described as "one of the most unusual Bollywood remakes" -- an Indian version, complete with musical numbers, of the 1975 blockbuster hit, Jaws. The movie was directed by Prem Lalwani and stars Nafisa Ali, Dharmendra, Vinod Mehra and Girish Karnaci as Jesu. Labels: Aatank. Bollywood Jaws. Movies we want to buy. Nafisa Ali. I have seen almost every mainstream Blood 'N' Bubble movie that has ever been made in English. So desperate am I to find movies that have underwater scenes I have taken to Dumpster Diving. That is what I call shopping at the Dollar Store, Walmart and the reject bin at Blockbuster. This weekend past I rented one movie (Shooter) and bought two DVDs at the Dollar Store. As is the case most weekends, it was that old cliche I came up with a few years ago: "You can lead a director to water but you can't make him dive." Shooter came out in theatres late last year and quickly migrated onto the shelves of North American video stores. Mark Wahlberg stars as Bob Lee Swagger, a poor man's Jason Bourne. He is framed for the attempted assasination of the US president (and the murder of an African bishop) and spends most of the movie on the lam from the FBI and evil private security forces. Shot twice and pursued by 20 or so Washington DC cop cars, Wahlberg drive backwards, at full throttle off a pier and into the Potomac River (actually a river in British Columbia stood in for the Potomac). Director Antoine Fuqua takes the action right down to water level where we see a suited diver getting ready to bail from his Zodiac and look for a dead Wahlberg in the wreckage of his submerged car. Before the viewer gets to go underwater, the camera cuts away to a land scene. Sigh. That was the only hint of diving in this 124 minute long action "thriller". Back to the Dumpster movies. I bought, for a dollar, a DVD with 3 full-length features: Born to Win, Gold and Death Sentence. Gold was the movie I wanted to review. It starred Roger Moore (of James Bond fame), had a picture of the star looking very 007ish and the description of the film made it sound like it was similiar, but better, than the movie Goldfinger. Moore plays the new manager of a South African gold mine who is tricked by the owners in to drilling into an underground lake. They want to flood the mine and force the price of gold to sky-rocket while blaming the mishap on him. Moore has to entered the flooding mine and block the channel of surging water. I thought there would be diving involved, but, instead Moore simply holds his breath a lot and grimaces. I watched it at 4 times the normal speed, but even in fast forward the movie is dreadful. Call it a Blood and Bubble lover's Fool's Gold. 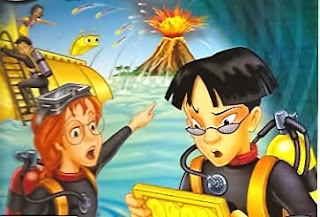 The last DVD I purchased for a dollar was Volcano Island, an educational animated movie/game for youngsters which involves a lot of diving. Volcano Island is so old my computer couldn't play it. I use System 10.3 (macintosh) and it was built for System 8. I won't know if it even qualifies as a movie until I drag an old mac out of the basement (I have the makings of a museum, 6 macs down there dating back to a Classic) and see if I can make it work. Don't be like Roger Moore and hold your breath waiting for my report.